UDOT is maximizing the current state-owned property and will only acquire the Right of Way (ROW) necessary to build and safely operate the expanded roadway, frontage roads, and interchanges. The project team is currently refining the design concepts and minimizing impacts wherever possible. The project team is evaluating the potential impacts to individual properties and determining if those impacts will require acquisition; however, not all properties located adjacent to U.S. 89 in the project area will be impacted. If some of your property is needed for the project, a project team member will contact you to provide more information and answer your questions. 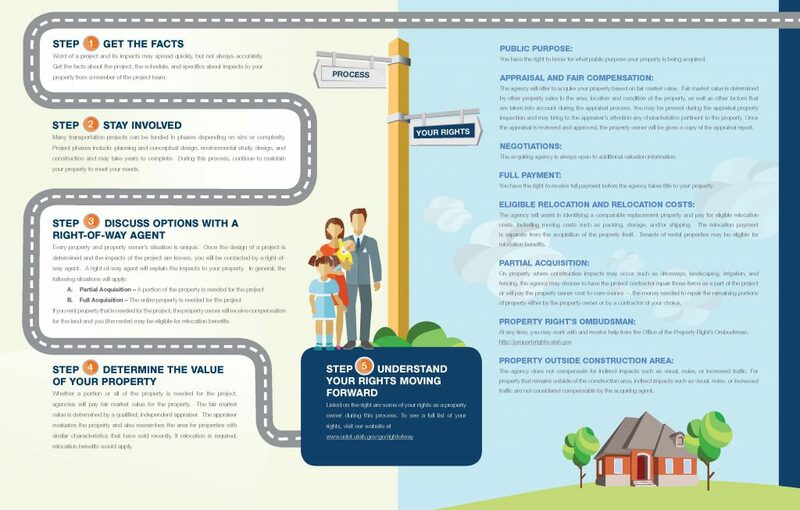 The graphic below provides a general outline of UDOT’s ROW process and details some of your rights as a property owner during the process. For all property acquisitions, UDOT follows state and federal processes and procedures (more info here at UDOT ROW).